Tangaroa is the god of the sea and all the fish. It was important for fishermen to stay in favour with Tangaroa. They had rules about when to fish, and how to make nets. In tradition, the hero Māui fished up the North Island, which is shaped like a stingray. The explorerer Kupe is said to have discovered New Zealand while chasing a huge octopus. Nets were made of green flax. Some were big enough to catch sharks. Fishermen tied hooks onto strong flax lines to catch fish, and sometimes they caught flounder using spears. They trapped crayfish in woven pots. Experts knew when the good fishing days were, and each tribe guarded their fishing grounds. They used tall poles to mark their place in lakes and estuaries. Fishing was a tapu (sacred) activity. Fishermen would offer prayers to Tangaroa and other gods, and no food was allowed on a fishing trip. When they caught the first fish they would return it to the sea, to thank Tangaroa. Special stones were put in the nets to attract fish. Fish were steamed or dried in the sun, and saved in storehouses. Sometimes tribes went on major fishing trips – as many as 1,000 people in 50 canoes. At one big feast, guests were offered 20,000 dried eels. Coastal tribes would exchange dried fish and shark oil for preserved birds and other goods from forest-dwelling tribes. After the arrival of European settlers in the early 1800s, traditional fishing declined. But the New Zealand government gave Māori quota of some commercial fishing grounds in 1992. Māori now own half of New Zealand’s largest fishing company, Sealord. 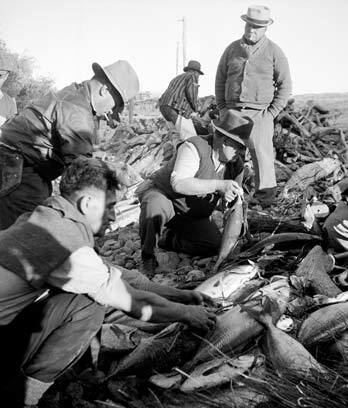 Māori people continue to catch fish in the traditional way. At feasts they enjoy dried flounder, shark-liver sausage and other seafood delicacies.